Grab Your 3 Free Tipster Trials Before They Go!! Tick…Tock…The clock is ticking if you are keen to take up our unique offer to enjoy 3 FREE 1-month tipster trials throughout the whole of June. And because the 3 tipsters on offer are of such high quality, I am keen for you to enjoy this offer as it will provide a fantastic launch-pad into the world of making money betting on horse racing. For those of you who may have missed our announcement of this offer last week, here is a quick re-cap on what is on offer. Anyone who signs-up for either a Smart Betting Club Gold or Platinum membership by Midnight on Sunday the 31st May will also enjoy a free trial during the month of June to 3 top tipsters. This deal would cost you £193 if you were to join all 3 of these tipsters yourself for 1 month – yet is available as a special FREE BONUS to anyone who signs up now. There are no hidden costs or small-print to worry about – simply sign-up today for your SBC membership (Gold or Platinum) and come the 1st June, we will kick-start your free trial with each of the 3 tipsters. To help showcase just how powerful these free trials are, last week I shared details on who each of them are and just why we rate them so highly here at SBC. You can read that article here or simply check out the profit figures for each long-term as copied below! TIPSTER 1: Northern Monkey Punter. TIPSTER 2: Morning Value Service. TIPSTER 3: James Boyle Racing. Both the first 2 tipsters (Northern Monkey & Morning Value) are Hall of Fame rated, meaning they are highly recommended by us personally at SBC, whilst James Boyle is next-up on the SBC review radar. All 3 are highly profitable long-term and much in demand amongst Smart Betting Club members so this really does represent an excellent starting point for anyone new to the world of successful betting. Everything we do is geared towards making you as much money betting as possible, so if yet to take the plunge, why not sign-up before Midnight this Sunday the 31st May and see how we can help you. Last week saw the release of the very latest SBC Tipster Profit Report, featuring the lowdown on a collection of horse racing tipsters making huge profits and giving bookmakers up and down the land a major headache. I have picked out just 10 out of the 32 racing tipsters we track and listed their performance if following at just £10 or £20 per point size advised and how much money they have made. (Sorry but as the full details of this report is so potent I have had to protect the tipster names and details for SBC members only – hence why they are Tipster A through J below). At just these simple £10 or £20 stakes, each of the above tipsters has made a fine profit and is maintaining a very strong Return on Investment (ROI), which is always a key way to analyse a tipster. Take for example ‘Tipster G’ who has maintained a phenomenal 30.73% ROI dating back several years and 4668 bets. Or even more recently, ‘Tipster B’ who costs just £10 a month, yet has made a 10.88% ROI and £5,719 per year at just simple £10 stakes. £10 a month for that kind of performance is fairly ridiculous! This is no flash in the pan either as the ‘Proofed By SBC Since’ column shows – as many of these tipsters have been proofing to us for several years over thousands of bets. Yet as good as the above table is – it isn’t the most scientific way of comparing tipsters. Instead we prefer to judge tipsters based on what we term ‘Betting Bank Growth’, which is effectively showcasing the tipster providing the biggest return, based on our sensible and realistic betting bank suggestions (something we explain in the 100-page ‘Pro Gambler Blueprint we supply to all members for free). For example, Tipster I has made as much as £6,910 to just a £1,000 starting point, nearly 7 times your initial investment. A great return however you look at it. All told, to 10 X £1000 starting banks you would be sitting on as much as £44,918.20 if you followed all these racing tipsters – an average of £4,918.20 profit per tipster. In each full Report, you can find a full rundown of each of the top services, who they are and how much they have made long-term, including the 10 featured above. So don’t delay, get signed up with us at SBC before the end of May and kick-start your way to racing profits with us! Wednesday saw the release of May’s Smart Betting Club Tipster Profit Report, which features the latest on several horse racing tipsters blitzing the bookies with their phenomenal tipping advice. So to celebrate its release, we have secured THREE extra special deals whereby you can pick up a free month’s trial with 3 top racing tipsters for the whole of June. This deal would cost you £193 if you were to join all 3 of these services yourself for 1 month – yet is available as a special FREE BONUS to anyone who signs up for either a Gold or Platinum SBC membership between now and the end of May. Sign-up for an SBC membership today! And with all 3 tipsters having a record of outstanding profits and service behind them, this is quite a deal as they are each very much in demand! Either sign-up right away or read on for more details on this extra-special offer. So you might well be thinking…well just who are these 3 top tipsters and why should you be so interested in following each of them for free for a month? TIPSTER 1: Northern Monkey Punter. Usually costs £50 for a 3 month subscription (no 1 month option). This is a long-term SBC Hall of Fame rated service, very popular with many of our members. The reason? Long-term proven success based on over 3000 bets and a Return on Investment (ROI) of 11.3% dating back to February 2010. Supremely easy to follow with detailed daily email updates – Northern Monkey won the Gold award in our 2015 Tipster Awards as voted for by SBC members. 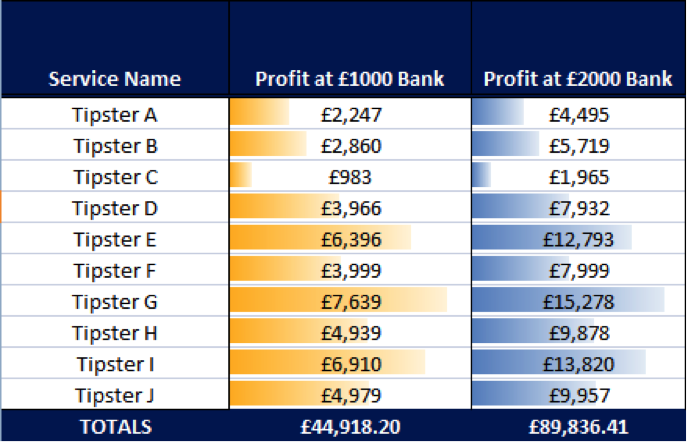 Results wise – to a £2000 or £4000 betting bank, your actual profit would be as big as £7908.25 or £15,816.50 to our recommended and sensible settings. Remember – you do not need a £2000 betting bank to follow this or other services, far from it – we simply use it as an easy figure you can use to compare and contrast with. TIPSTER 2: Morning Value Service. £400 for a 3 month subscription. (no 1 month option). This is another long-term Hall of Fame rated service, which once again is much in demand in the racing tipster world and it’s easy to see why. The profit figures are simply phenomenal, based as they are on over 22000 bets, dating back to July 2011 and a ROI of 11.6%. Yet it is not the ROI that offers the most appeal for members of this service but the Return on Capital, or explained another way – the amount of money you can make from a starting betting bank. A simple £2000 betting bank would have grown as much as £13,820.30 whilst at just £5 per point, you would be sitting on a very tidy profit of £12,956.50. TIPSTER 3: James Boyle Racing. £130 for a 3 month subscription. (no 1 month option). The 3rd and final tipster available for free during June is one we have been analysing recently as they are due to be reviewed in-depth in the very next SBC Magazine. All the signs point to a very good service indeed and with a limit on the number of new members they will take on, the free trial on offer with us is an especially unique deal. Performance wise, they tick a lot of boxes with a 23.3% ROI from over 1055 bets dating back to 2011. In terms of actual money in the bank, the figures are once again impressive with upwards of £5,800 profit from a simple £4000 betting bank (excellent figures, especially when bearing in mind, this is only over 1055 bets. So there you have it – 3 fantastic racing tipster services, each of whom you can follow for free during the whole of June courtesy of this extra special SBC offer. To sign-up with each of these tipsters for 1 month individually would cost the equivalent of nearly £200 so it really is a tremendous deal and one not to be repeated anytime soon. These are 3 bonafide, excellent and most of all supremely profitable tipsters that are a must for anyone keen to start making more money betting on horse-racing. Remember – all you need to do to qualify for your 3 free trials is simply sign-up for either a Gold or Platinum Smart Betting Club membership and come the 1st June, we will kick-start your free trial with each of them. 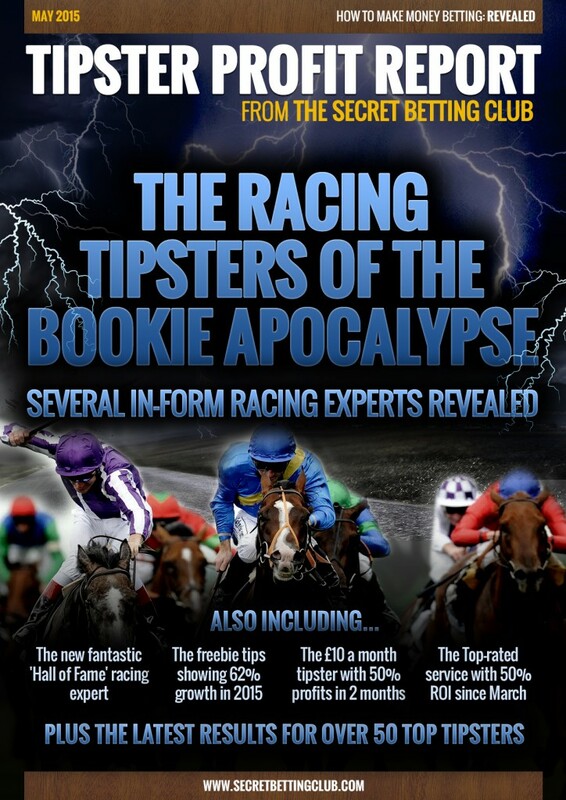 Who Are The Racing Tipsters Of The Bookie Apocalypse? The very latest Smart Betting Club Tipster Profit Report has just been published, featuring details on the outstanding performance from several horse racing tipsters who can’t stop bashing the bookies. All told, our Tipster Profit Report features the latest results for 57 of the very best betting tipsters (Horse Racing & Football) that we have uncovered in 9 years of independent reporting. Helping YOU identify which tipsters are genuinely profitable. 1. The new fantastic ‘Hall of Fame’ expertmaking big profits (Over 1000 bets and a 25% ROI so far!). 2. The top-rated service on-fire with a 50% Return on Investment since March (And 30% ROI long-term). 3. The freebie tipster with 62% betting bank growth already in 2015. 4. The £10 a month tipster with a 50% increase in profits in the last 2 months alone. PLUS Many, many more top-performing racing tipsters we simply don’t have the room to write about here!! > The Latest Sports Tipster Results: Read the latest performance figures for the 22 sports tipsters we also proof and their ongoing profit and loss figures. Find the best sports betting tipsters designed to make you money long-term. > The Best ‘Hall of Fame’ Tipsters: Discover who the 20+ top tipsters are that we independently recommend to our members. All of whom have proven records of making a profit. > Detailed Ratings On Every Tipster: Each of the 57 tipsters we track has its own designated Key Facts Page with 10 different ratings on everything from cost to customer service and profitability. > Massive Tipster Discounts: How you can save £££’s on the cost of joining many popular tipsters through the special deals we negotiate on our members behalf. And all from the only 100% independent tipster source! Yes that’s right as whilst all other review sites use affiliate links or make money referring sales to the tipsters, all SBC tipster reviews and ratings are 100% independent and affiliate-free! This week we’d like to share a sample review of a racing tipster Bet Alchemist from January 2015. This review is typical of unique content and in-depth tipster analysis we publish on a regular basis, all designed to help you make money betting. If you enjoy this review and want dedicated, independent help with your betting then please do consider a full Smart Betting Club membership, where you can read hundreds more in-depth tipster reviews like this. Our May Tipster Profit Report is due next week and we’re thrilled to report some strong racing tipster profits. Don’t forget either that the Smart Betting Club is 100% independent, so you can be assured that what we say is the honest truth. Unlike other ‘review’ services we do not take fees or a cut of sales for writing a positive review. So for more information on how we can help you make money betting please visit www.secretbettingclub.com and start your membership straight away! Service In Brief: Ireland-based horse racing tipster, advising most bets each way with prices within the longer odds ranges. 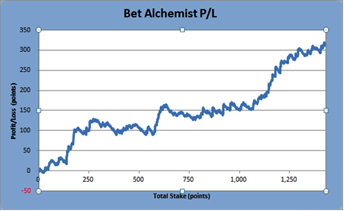 The Bet Alchemist service started issuing betting advice to the public in December 2012. Service in Detail: Bet Alchemist is run by 40 year old Nicky Doyle. Based in Kilkenny, Nicky grew up in the heart of horse racing country in County Wexford. With this background and influenced during his formative years by his racing-crazy elder brothers, he was always destined to play some sort of role in the sport of kings. Not only does Nicky now run the Bet Alchemist service, but he has also joined the ranks of racehorse owners and has the lofty ambition of owning shares in a Cheltenham or Punchestown Festival winner. Approximately 80% of all bets are advised each way, the rest being win only with the occasional multiple bet thrown in. The average odds for the each way and win bets stands at 11.2/1, so we can see that Nicky likes to play at longer prices. The winning strike rate for the each way picks is currently 10.9% (with 33.3% of these selections placing), and 28% for those horses advised win only. It should be noted that credit is due to Nicky, who does account for Rule 4 deductions when keeping official performance records, something that many horse racing services decline to do. We can see that the figures returned are very impressive; an ROI of 21.7% highlights the considerable potential of the Bet Alchemist service, as does the fact that a starting bank of 100 points has more than tripled in just over two years of betting. As previously noted, Nicky was born and raised in Ireland and when we analysed his results, it was notable that a good number of his bets have been struck in races on the Emerald Isle. Perhaps only fellow Irish tipster Will Lattimore carries a higher proportion of bets in Irish racing. With this in mind we broke down the results to separate those achieved in Ireland from those bets on runners in the UK and elsewhere. An ROI of 41.4% and a level of profit that accounts for 84.74% of total service profit demonstrates clearly that Nicky is able to fully exploit his in depth knowledge of Irish racing to the benefit of his subscribers. We recommend a bank of 100 points for following Bet Alchemist, which is based on simulations and a comparison with other horse racing services of a similar profile. This is higher than the 80 points that Nicky himself suggests, but as you know we always prefer to err on the side of caution, especially until we have followed a service for some time and allowed confidence to grow. An 80 point bank we see as just about acceptable, but representing the bare minimum required. 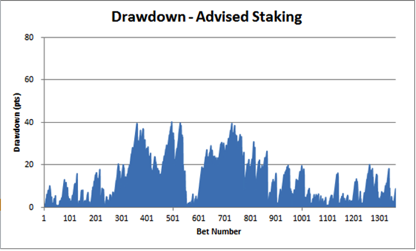 The largest drawdown so far has been 40.2 points, suffered between early May and the end of August 2013. To help observe price availability, we asked our service tester, Gregor to keep an accurate record of the prices he was able to track at the time of advice. Gregor’s record is actually marginally better than the official profit and loss records kept by Bet Alchemist for the period November 2013 to November 2014. Bet Alchemist is a service of many obvious positives. The performance figures after 1,300+ bets are impressive. It is a well organised service, and pricing levels are set at an affordable level. If the current levels of performance can be maintained, then there is definite potential for inclusion of Bet Alchemist in the Hall of Fame. Prior to such a move being made, we would first like to further analyse the issue of odds availability. We have found Nicky very pleasant to deal with, providing full and comprehensive answers to any questions we have asked him. A real pride in his service is apparent, as is a desire to satisfy his customers. We await his new website with eager anticipation. To sum up then, in Bet Alchemist we have a service with real Hall of Fame potential, and we look forward to monitoring progress moving forwards. Want More Reviews Like This? If you want to find out just who the very best tipsters really are then make sure you take up a Smart Betting Club membership today. Next week we release our Tipster Profit Report – Packed with the very latest results from the sports and racing tipsters that we monitor. It’s a great time to join as well with many of the racing tipsters that we track enjoying a solid few months. Those readers of a certain age (in the UK) will remember the wonderful book by Sue Townsend –The Secret Diary of Adrian Mole, Aged 13 ¾ . The book follows the travails of teenager Adrian as he navigates typical problems such as acne, girls and his neighbour seducing his mother. Here at the Smart Betting Club we have our very secret diary, but in this case focusing on the ups and downs of professional gambling. Our Mole in this case is Rowan Day, a pro punter who is well past his teenage years, but still has to contend with issues such as cricket matches interfering with bet placement. The names of tipsters that Rowan uses have been removed for the benefit of paying Smart Betting Club members. To find out more about an SBC membership click here. Nine winners from nine on Saturday, and Justin Rose winning on the PGA Tour yesterday meant that for a second weekend in the month, [TipsterH] had a stormer. Shame I missed out on the first weekend, eh? This will have been a bumper month for [TipsterH] followers. That it is not as big a month for me as it will have been for others is, as you can tell, really winding me up. I need to let it go and move on. Honestly, I’ve not grieved so much since family pet ‘Hammy’ the hamster died back in ’79. Still, even without this boost [TipsterH] has had a month to savour and was by far my best performing service for April. Although the figures don’t go into last month’s totals, it was great to see a long term bet on Brentford landed on Saturday, one of the few antepost bets I was able to place at fairly decent odds at the beginning of the footie season. I’ve had a couple of antepost losers too, but I’ve been fortunate in that the long term bets I have been able to place have come in, and some of those I wasn’t able to have gone on to be losers. Swings and roundabouts I guess; the betting equivalent to that well worn football mantra of luck evening itself out over the course of a season. At the risk of tempting fate, and touching wood whilst offering a silent prayer, it is to be noted that there have been one or two signs of life for [TipsterJ], a service that has lain dormant for some time. I’ve made a lot of money from this service in the past, and although my faith hadn’t completely dwindled, I couldn’t help but wonder if perhaps it had seen it’s best days. Although not a huge profit in the month gone, I did get the feeling that there was more consistency in their approach and it “felt” more like the service of old. My most consistent service by far is [TipsterT], and April was another solid month for the South American expert. It’s not the simplest service to follow – far from it in fact, with odds crashing fast – but happily for 80% of the bets that come through, I tend to be at the laptop at the time of release and so generally speaking, I’m ok.
[TipsterT] April: Staked 169pts, +11.536pts. One of the more inspired decisions I’ve made about my betting recently was to drop the football Combo bets this month. I made this decision not because I felt the system has no merit (indeed, on the contrary), but because I hadn’t fully settled on my own Combo strategy. Experience has taught me that if there is any lack of certainty in my method of following a service or tipster, or in this case a combination of tipsters, then it is better to stop putting the money down and wait until there is 100% clarity in terms of the way forward. What I can’t claim is some great foresight that told me that [Tipsters X & Y], two huge contributors to the Combo method, would each suffer a torrid April. I can’t imagine they would be great results and I feel I’ve dodged a bullet here. Rounding up the summary of football services, and we come to the seemingly ever-reliable The Fink Tank. I know that, like any service/system, it has bad spells (seemingly the 2013/14 season was one of them), but this season it has been great. It hasn’t been such a happy time for [Tipster B], but previous heroics prevent there being too many feelings of reproach for the NBA specialist. There’s not too much to say, other than it would be nice for what has overall been a highly successful season if it were to finish strongly through May. Here’s hoping. (Staked 148pts, -17.242pts). There’s no escaping the fact that [TipsterTT] had a shocker of an April. Looking at previous months’ results, it was due one, and something I have learnt already from following this service is that losses can, and have been previously, recouped at a rate of knots. In simple, black and white terms, this service has dragged my overall monthly profit right down, but therein lies the problem of splitting overall performance into monthly chunks. 30-31 days really is no sort of time period to evaluate performance. It was good to see [Tipster O] embark successfully upon the beginnings of a recovery mission to regain points lost through the early part of the year. As a Smart Betting Club member Rowan has benefited not only from our in-depth reviews of profitable tipster, we also supply dozens of articles on professional betting topics such as bankroll management and betting psychology.This means that Rowan is able to manage his portfolio of tipsters effectively so that no tipster dominates his profit and loss. His final tally for April shows an ROI of 1.34% and a Return On Capital of 1.13%. As Rowan says – Not the best month in the world, but not the worst either.Some tipsters stake more than others and some may take on higher odds selections which means if you had £1,000 invested with each tipster you would stake dramatically different amounts per bet / per point. If you want to find out more about professional punting and the tipsters that really make money then take up a Smart Betting Club subscription today. As we reach the 1st of May, the Premier League title is firmly in the hands of Chelsea. 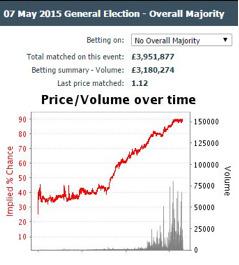 However, there is another betting market hotting up right now with all still to play for – The UK General election. 2015 is likely to be one of the tightest elections in living memory, so if you fancy a flutter you’ll need to be on your toes. This complete guide to betting on the general election 2015 breaks down the key markets, the latest odds and any value bets. First let’s start with a look at the big picture. • Probability that there will be no majority government: 90%+! In 2010, the Tories got over the 326 seat threshold (more than half the house) with the help of the Lib-Dems in a coalition. This time around however, not only are the Tories expected to fall short again, the Lib Dems are unlikely to gain enough seats to help them out. So – no overall majority. So what’s likely to happen? Everything is still to play for, but the most likely outcome is for there to be a minority government. The government won’t have half the seats, but will get by with informal agreements with various parties for support on individual issues. The key will be to get enough support to pass a vote of no confidence. As you can imagine, there will be lots of promises, deals and general shenanigans as parties jostle for power and influence. So how have we come to this? 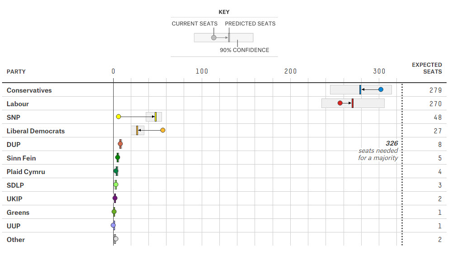 There are three big reasons for the potential spaghetti cluster fudge that UK politics are about to enter, all neatly summarised by this neat little chart from FiveThirtyEight.com. 1. The Lib Dems Broke Promises – Well in the eyes of key voters, especially students, this is what happened. Either way, the number of Lib Dem seats is expected to plunge. 2. 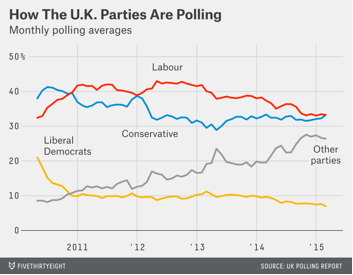 The rise of UKIP – In the last few years, UKIP have risen to take an increasing share of the vote initially from Tories, but also from Labour more recently. This share isn’t enough to see them win many seats (just two at recent estimates), but it is enough to nick votes from the Tories primarily. 3. Scottish Power! – Following the independence vote, the Scottish National Party are riding a wave of goodwill and are expected to secure 52/59 seats North of the Border. Many of the seats were former Labour Strongholds. The SNP will be the third largest party in Parliament, but their role is likely to be complicated. They won’t form a coalition with the Tories and Labour have ruled out a coalition too due to negative feeling this creates in English voters. So where do we find our value bets then? 2) What Do the Betting Markets Say? First let’s take a look at the key betting markets and the current favourite. Oddschecker – Leading odds comparison site. Betfair Exchange – The best odds and great for trading. Matchbook Exchange – Offering commission free betting on the election. One way to find value bets is to compare the latest betting odds to the national polls…However this doesn’t even come close to telling you half the story! If the polls directly translated into seats, then UKIP would be a power broker in parliament. The fact is that UK elections come down to a small number of constituencies. Vast swathes of the country will always be Labour and vast swathes will always be Tory. The key is what is likely to happen in the key undecided or ‘marginal’ seats. Political polling is a highly sophisticated affair nowadays, but one person to listen to is Nate Silver of fivethirtyeight.com who gained a huge following after correctly calling the last two US elections. This stats genius has partnered with a number of UK academics to produce what is likely to be the most accurate prediction of the general election. This model takes into account everything from marginal polling from the Likes of Lord Ashcroft to historical voting patterns. In one graph you have what is likely to be a highly accurate prediction of the 2015 election. 3) What Are The Value Bets? The key to political betting is to vote with your head not your heart. You may or may not like the idea of Ed Miliband becoming Prime Minister, but it’s what the betting markets are currently saying is the most likely outcome. and lordashcroftpolls.com we’ve arrived at what could well be value bets in this election. Verdict: Value Bet – The prediction models are saying there’s 98% chance of a hung parliament with 90% accuracy, so the odds should be 1.02 not 1.13. Verdicts: No Value – The 90% confidence range for outcomes in these markets are just too wide to be taking odds like 1.32. The Maths stack up for the Labour Minority government odds, but we’d prefer not to bet on something that depends on political horse trading! There is one market well worth a look at though, based on the chance of ‘Shy Tories’ coming out and changing the vote. Back in 1992 polling was neck and neck between Labour and the Conservatives, but the Tories won easily in the end. It turned out that everyone saying “don’t know” in the polls was either not willing to admit to voting Tory or just ended up voting for who they voted for last time (Tory). Opinion polls have been adjusted to account for this, but there’s no way of knowing how accurate these adjustments will be in another tight race. With the Tories expected to win 279 seats, there could be some hidden upside in betting on them to win between 276 and 300 seats at 1.98 with Betfair. We hope you’ve enjoyed this summary of the General election 2015 betting options. We’re officially politically neutral in this and have tried to stick to what the markets and expert statisticians are saying in this analysis. The internet and political arguments are messy bedfellows so we have purposely tried to avoid any comment! If you liked this article then check out what else the Smart Betting Club has to offer for punters looking for an edge. From beginners guides to tipster reviews, a Smart Betting Club membership is your ticket to better betting.